Official commissioning photograph of #26 on the Ferrymead Tramway following restoration. Note: this photograph was taken 2 days before final comissioning - the "bonging" hoops on the top deck have not yet been fitted. Taken 21st Jan 2010 by D L A Turner. First offical run after recommisioning on 23rd January 2010, with double decker trailers 10 & 74 in tow. Driven by Mayor Bob Parker, and decorated as in 1905 for the CTB opening. Photo Colin Loach. Electric tram number 26 in its original form very early in its life c 1905. It would probably also tow the two double decker trailers on its trips to Sumner. Note: no windscreens, and no extensions to the handrails which dates it to this period. 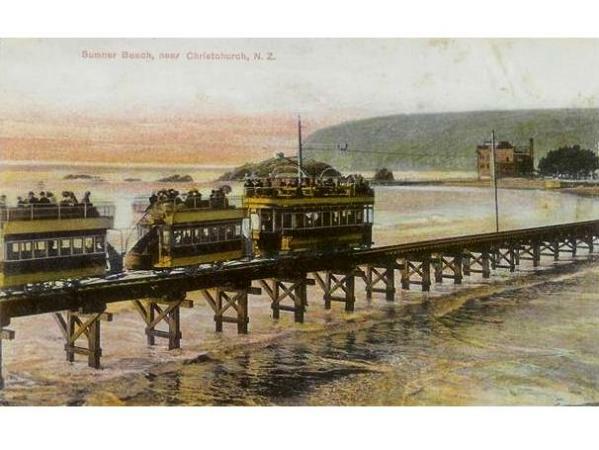 A coloured postcard - from the period 1907 - 1910 - showing an electric double decker tram car (perhaps 26?) plus two double decker trailers on its way across a causeway into Sumner. Postcard: Gold Medal Seried ltd., Fergussson Ltd. No 1745. The remaining body of 26 being extracted from the house at Hakatere in 1986. Note that the body has only 6 windows worth of the bottom deck (out of 8) remaining. Picture of 26 undergoing restoration. 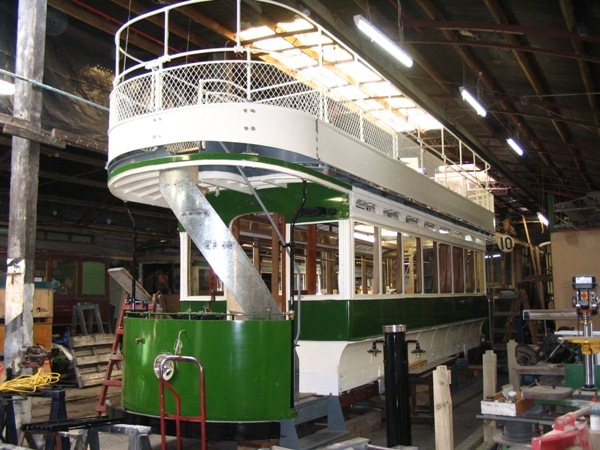 Compare with the previous photo, all eight windows on the bottom deck are restored, stairs have been rebuilt and the top deck and associated hand railsare back in place. Note: as the Society does not have plans, the restoration work is being undertaken from photos such as the first one shown for this tram. Photo: Stephen Taylor, 4th Oct 2008. Date Built 1905 by John Stephenson & Co, New York. Written Off 1953 (as Trailer no 145). Restored Enter edservice after restoration 23rd Jan 2010. Restored to its appearance in 1906. Number 26 is one of three open top double decker electric tram cars (numbered 24, 25 & 26) purchased from John Stephenson & Co of New York in time for the opening of the electric tramway in Christchurch in June 1905. (In fact, number 26 was spotted and photographed in Cathrdral Square undertaking a trial a few nights before the offical opening of the electric tramway). 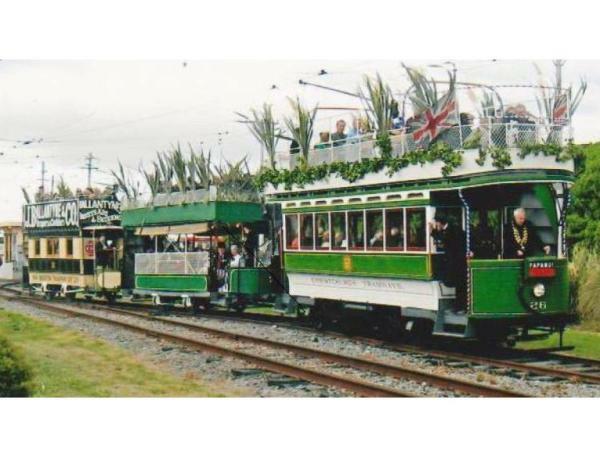 As with the other double decker electric tram cars, number 26 was originally used on the run out to Sumner where it typically would tow a couple of double decker trailers. All three double deckers went through a number of major changes in their life. Within two years of entering service, all three double deckers had been fitted with "windscreens" - to make them somewhat more pleasant to drive in Christchurch winters. (This also applied to all open-fronted electric trams - for example Christchurch Number 1). ...and then into trailers in 1920 with new four-wheel Brill radiax trucks. In trailer form, these trams were refered to as "Facing mothers". The original running gear and trucks - and their numbers(!) were used for the second series of hills cars, and the body of the original number 26 became trailer 145. Finally, at then end of its life, the body of 145 (aka 26) was sold and converted into a holiday home at Hakatere Beach, where over time, a house was errected around it. ...restoration back into a double decker tramcar. 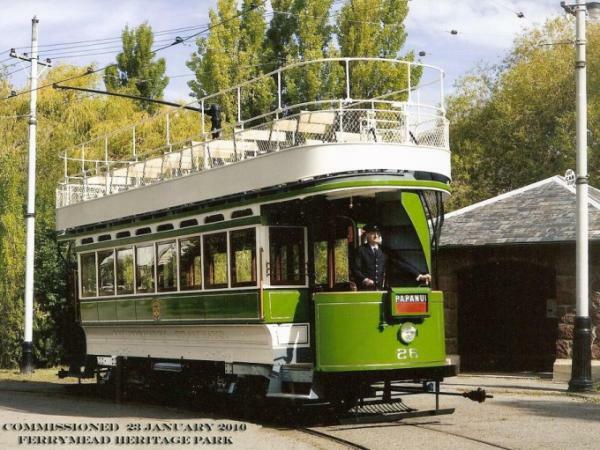 This restoration was completed and the tram went into service on 23rd Jan 2010 on the Ferrymead Tramway following a re-comissioning ceremony in the Ferrymead township. The ribbon was cut by Mayor Bob Parker and the donor of the body Ivan Taylor. Durning the opening ceremony and for the rest of the day, #26 was decorated with flax and toi-toi similar to its appearance in 1905 at the opening of the CTB Electric Tramway cemerony, and pull two similarly decorated double deck trailers - #74 and #10.